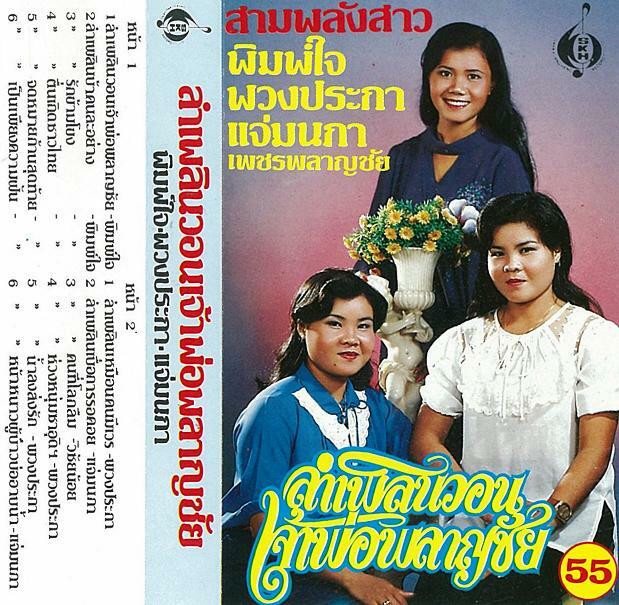 last week we had some "modernized" molam sounds, this week maybe a bit less so.. here's a fantastic tape from sam phalang sao ("3 tough girls"), phimchai phetphalanchai & her sisters. all i know about these three is that they hail from roi et in thailand's northeast, and i think phimpchai was more sucessful as a solo artist & in duet with thepphon phetubon.. i have never heard of phuangpraka or chaemnapha besides this tape. in addition to the great vocal work from the sisters, these songs are packed full of isaan sounds; lots of khaen, plenty of so fiddle, some great phin & full band grooves and even the exceedingly rare phin hai, a set of jars with rubber bands stretched across the mouths, which produce a low, rhythmic sliding pitch.. plus some weird futuristic synth sounds for good measure! interestingly enough, the saudi arabia theme crops up here too.. cool to see how these 2 streams of molam (this week's & last's) could be basically contemporaneous.. enjoy! Belated thanks for your MANY treasures! I have jammed my HD with your treasures of intangible culture! THIS ONE is a stand out! Those are three truly tough girls! Just found this one, & I love it! thanks again, Cao Sao Vang!